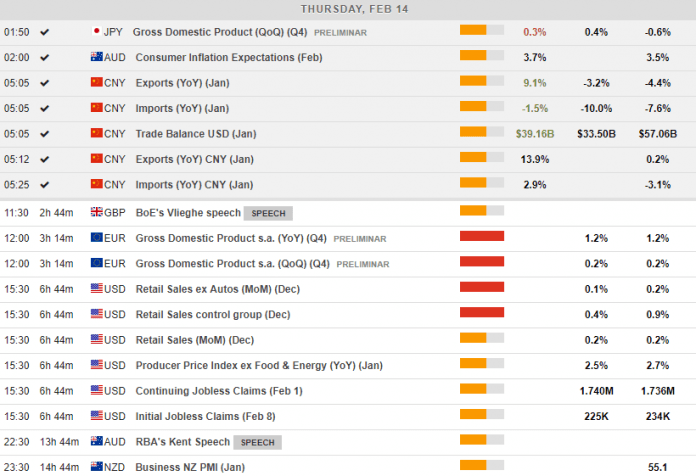 Topix and Nikkei closed little changed, the Hang Seng is down -0.26% while CSI 300 and Shanghai Comp are up 0.33% and 0.13%, after Chinese data showed a rebound in exports at the start of the year. The tech hub of Shenzhen outperformed with a gain of 0.93%, but the ASX also closed with a marginal loss. US futures as well as European futures are moving higher though, so there is still some life in markets after reports that the U.S. is considering delaying China tariffs for 60 days. President Trump had already told reporters that trade talks are making good progress. EU GDP – The common currency’s GDP is expected to have grown by 1.2% y/y on the final quarter of the year, the same growth rate recorded in Q3. US PPI Inflation – In accordance to the slowdown picture in the US, PPI inflation is expected to have slowed to 2.5% y/y in January, compared to 2.7% y/y in December. US Jobless Claims – Continuing Jobless Claims are expected to have increased to 1.74M on the week ending at January 8, compared to 1.736M last week. Initial Jobless Claims are expected to have decreased to 225K compared to 234K on the previous week.